1861: Schnellzug (fast train) Paris - Vienna is mentioned, probably no through-running, 1870/71 interrupted by war. 1872: Compagnie Internationale de Wagons-Lits founded by Georges Nagelmackers, test run of a sleeping-car Paris - Vienna in the "Courirzug". 1873: Short-term partnership with William d' Alton Mann from USA. 1882 : Test run of the exclusive CIWL " Train Eclair " (in German " Blitzzug ") Paris - Vienna on Oct. 10 - 14. 1883: First trip of the CIWL de-Luxe Express d'Orient on June 5, followed on October 4 by the official inauguration. This Orient-Express consisted exclusively of compartment sleeping cars and a diner, with locomotives by the various railway administrations, running Paris Est - Munich - Vienna - Budapest - Bucharest - Giurgiu, connection with a simple train Ruse - Varna and a steamer to Istanbul. 1885: Orient-Express with an additional run via Budapest and Belgrade to Nis, stage coach and train connection to Istanbul. 1888: Orient-Express Paris -Belgrade - Istanbul Sirkeci and Paris - Bucharest. 1888: Conventionszug Vienna - Istanbul, later Thessaloniki, by state railways, which ordered special cars with sleeping accommodation in competition to CIWL. 1889: Orient-Kurierzug a short-lived Prussian service Berlin - Oderberg - Budapest. 1894: Oostende-Wien-Express, a CIWL de-Luxe, temporarily combined with Oostende-Kartsbad, Oostende-Wien-Triest- and Oostende-Wien-Konstanza-Express. 1897: Orient-Express via Salzburg instead of Simbach. 1900: Karlsbad-Express, a seasonal CIWL de-Luxe, Paris - Karlsbad (not yet combined with Orient - Express). 1912 and 1913: Istanbul branch temporarily interrupted by Balkan wars. 1914: CIWL de-Luxe trains stopped by WWI. 1916: Balkanzug Berlin - Iglau - Vienna - /Strasbourg - Vienna -/Berlin - Breslau - Galanta - Budapest - Belgrade - Istanbul, Prussian and requisitioned CIWL sleepers and coaches until 1918. 1919: February: "Orient-Express Train de luxe militaire" by CIWL Paris - Basle - Arlberg - Vienna - Warsaw / - Linz - Prague (until 1920). 1919: April 1: Simplon-Orient-Express, a CIWL de Luxe Paris PLM - Trieste with WL to Bucharest and Zemun ; from July 1, 1920 Paris - Istanbul, with WL from Boulogne and Oostende via Milan (until 1925) and branch P.A. to Athens. 1920: "Boulogne/ Paris-Ostende-Strasbourg-Vienne-Express, "a CIWL de-Luxe with a branch to Prague - Warsaw (until 1921). 1921: Re-introduction Orient-Express, CIWL de-Luxe Paris - Bucharest, with WL from Calais, Oostende and Amsterdam, combined with seasonal de-Luxe Karlsbad-Express with Prague branch. 1923: Orient-Express temporarily diverted via Arlberg (until 1924). 1924, November: Suisse-Arlberg-Vienne-Express, a CIWL de-Luxe Paris Est - Vienna with WL from Calais/Boulogne, combined with Oberland-Express to Intertaken and Engadin-Express to Chur. 1925: Re-introduction of Oostende-Wien-Express as a CIWL de-Luxe, with WL from Amsterdam, combined with Orient-Express and Karlsbad-Express from 1928 with WL Oostende - Istanbul. 1929: CIWL "Pullman" day trains in Romania, from 1933 Fulgur Regale Carlo Bucharest - Constanza. 1930: WL Berlin - Breslau - Istanbul, Prague - Istanbul and Athens in Simplon-Orient-Express. 1931: Arlberg-Orient-Express CIWL de-Luxe Paris - Budapest, sleepers to Bucharest. 1931: Orient-Express with a WL Paris - Istanbul for Simplon-Orient-Express (not 1933 - 1934/35). 1939: CIWL de-Luxe trains stopped by WWII. Orient and Simplon-Orient-Express continued running until 1940. 1941: D 148/147 Berlin - Prague - Sofia and sleepers from Torino and Rome, connections to Istanbul and Athens, later interrupted. 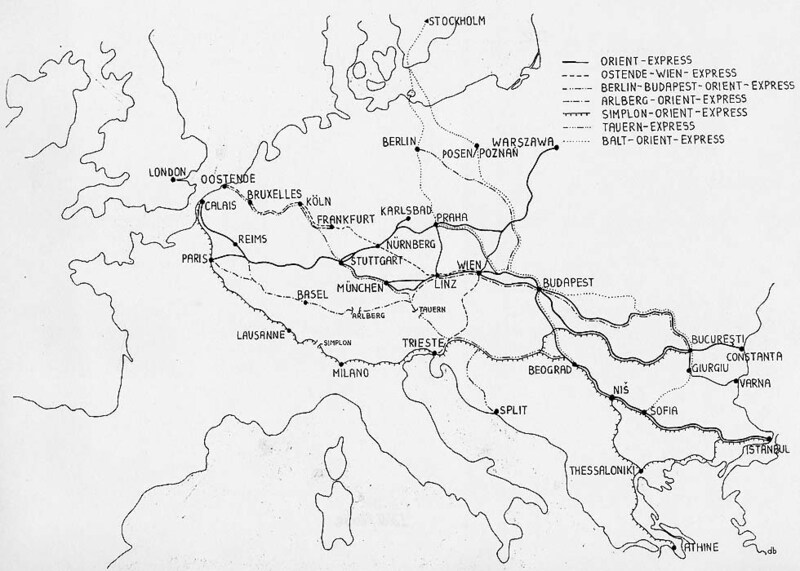 1945: Beginning re-introduction of the Orient Expresses network, now including ordinary coaches by the various state railways, from Sept. 1945 Arlberg-Orient-Express Paris - Innsbruck, then Vienna, 1946 Prague via Linz, Calais, Budapest, 1947 Bucharest, temporarily also Prague- and Warsaw - Bucharest. Winter 1945/46: Simplon-Orient-Express Paris - Venice, cars from Calais and temporarily to Rome. 1946: Orient-Express Paris - Linz, temporarily Innsbruck via Lindau. 1946: Orient-Express branch Paris-Praha-Express, later to Warsaw, from 1947 also Oostende - /Amsterdam - Prague, Bucharest - Budapest - Warsaw from Arlberg-Orient, Belgrade - Warsaw. 1947: Simplon-Orient-Express to Sofia, then Istanbul, temporarily cars from Arlberg-Orient via Tauern and cars Thessaloniki - Istanbul. 1948: Orient-Express to Bucharest via Bratislava, temporarily cars Paris- and Prague - Belgrade. 1948: Oostende-Wien-Express, initially combined with Orient- and Paris-Praha-Express, from 1950/51 a separate train Oostende - Vienna. 1948: Balt-Orient-Express, intended as a connection Stockholm - Istanbul, introduced and equipped by the various railway administrations of Eastern Europe, Stockholm - Odra Port - Poznan - Zilina - Budapest - Belgrade, branch Balt-Express to Prague, cars from Warsaw and from Prague, cars to Istanbul with Simplon-Orient, from 1949 cars Berlin - Poznan - Bucharest. 1949 or 50: Balt-Orient-Express no longer to Belgrade, from 1951 to Sofia via Bucharest (until 1957). 1951: Orient-Express confined to Vienna, from 1952 to Bucharest with Arlberg-Orient. 1951: Simplon-Orient-Express with a branch Nis - Athens. 1951: Tauern-Express Oostende - Belgrade, 1953 to Athens, combined with Simplon-Orient-Express (until 1962). 1954: Balt-Orient Express ferried via Trelleborg - Sassnitz instead of Odra Port, now via Berlin - Prague. 1955: Balkan-Express Vienna - Zagreb - Thessaloniki - Istanbul with WL from Simplon-Orient, later via Sofia and also to Athens, combined with Jugoslavia-Express. 1956: Orient-Express to Bucharest via Hegyeshalom. 1957: Pannonia-Express Berlin - Bucharest, combined with Arlberg-Orient. 1957: Karpaty-Express Warsaw - Bucharest via Przemysl - USSR, from 1988 via Kosice - Hungary. 1959: Balt-Orient-Express confined to Berlin - Prague - Balkan, until 1960 branch from Warsaw via Breclav. 1960: Simplon-Orient-Express Paris - Athens/ - Istanbul accelerated, with branch Paris - Naples. 1961: Orient-Express confined to Prague and temporarily to Vienna. 1962: Arlberg-Orient-Express Paris - Bucharest replaced by Arlberg-Express Paris - Vienna. 1962: End of the train system Simplon-Orient-, Balt-Orient and Tauern-Express. Balt-Orient-Express confined to Berlin - Bucharest. Simplon-Orient-Express replaced by Direct-Orient Paris - Milan - Istanbul/ Athens with a branch Warsaw - Sofia (Polonia-Express) and Munich - Athens, from 1966 Tauern-Orient Munich - Istanbul/ Athens (until 1979). 1962: Austria - Express from Hoek extended to Athens (instead of Tauern-Express), stopped in 1965 due to constant late-running. 1963: Hellas-Express Dortmund - Athens, from 1965 also Istanbul-Express, temporarily combined. 1965: Orient-Express with a CIWL sleeper Paris - Bucharest (until 1987). Paris - Prague via Frankfurt, no longer with Orient-Express. 1963: Tourex special Dresden - Varna (until 1989). 1968: Akropolis Munich - Athens (until 1991). 1969: Short-term all-sleeper specials Paris - Mestre and Paris - Innsbruck - Toblach by CIWL subsidiary "cet". 1968: Soviet sleeper (RIC type) Moscow - Sofia - Istanbul by Danubius and Istanbul-Express. 1976: Nostalgie Istanbul Orient Express, the first nostalgic all-sleeper de-Luxe, consisting of ex-CLWL cars, introduced by Alby Glatt, running as a tourist special to Istanbul and European destinations. 1977: End of the sleeping cars Paris - Istanbul and Athens from Direct-Orient. 1982: Venice Simplon-Orient-Express Boulogne - Venice, an all-sleeper de-Luxe consisting of rebuilt - CIWL cars, connection London - Folkestone by an all-Pullman de-Luxe, introduced by James B. Sherwood (owner of Sea Containers group), from 1984 via Arlberg - Brenner, later also trips to Vienna, Budapest, Prague, Istanbul, 1993-98 with a Dusseldorf branch, from 2001 Calais - Venice. 1989: Attika Munich - Athens, only sleepers by JZ, CH (ex-DB), couchettes and motorcar transport. 1993: End of the Attika and of the Skopje-Istanbul-Express Munich-Istanbul/ Skopje, consisting only of sleepers by JZ, initially also TCCD, couchettes and motorcar transporters. 1994: Pullman-Orient-Express by Wagons-Lits, for hire. 1995: End of Balt-Orient-Express Berlin - Bucharest. 1998: First trip Paris - Bucharest - Istanbul by the Venice Simplon-Orient-Express. 1999: Balkan-Express Budapest - Belgrade - Istanbul confined to Belgrade - Sofia, temporarily stopped. Optima private car-carrying trains Lebeny - and Villach - Svilengrad and Villach - Thessaloniki continued services. 1999: A modern all-sleeper special by TCDD Istanbul - Bucharest - Prague - Vienna - Istanbul undertook only one trip. 2001: The state-owned Orient-Express Paris - Budapest, from September 1998 with a Romanian sleeper Paris - Bucharest, was limited to Vienna. 2001: Nostalgie Istanbul Orient Express stopped, temporarily re-started. 2005: Filia sleeper train Thessaloniki – Istanbul, stopped 2010. 2005: Athens – Corinth - Kiato conversion to new standard gauge line, in 2010 electrified, to be extended to Patras. 2007: “TGV Est-europeen”, LGV in France to be fully completed in 2009. Dec. 2007: TGV Paris – Munich, ICE3 Paris – Frankfurt, Orient-Express confined to Strasbourg – Vienna, stopped in Dec. 2009.